The ruling is far too broad. Zoeller released a statement saying he will support a rehearing of the case due to concerns that the court ruled too broadly when it found citizens have no right under common law to reasonably resist police who unlawfully enter their homes. “In our brief and argument to the Indiana Supreme Court last fall, my office did not advocate for the type of ruling the court issued last week. I believe a reconsideration is appropriate. A rehearing and a new ruling would afford the Supreme Court the opportunity to clarify any misperceptions regarding people’s Fourth Amendment right to be secure in their homes against unreasonable searches and seizures – even against unlawful entry by police,” said Zoeller, a Republican. This is a good development. The decision was unnecessary, went too far and was way over the top. I’m surprised at the lack of comments on your article. I purposely delayed my comment thinking that someone more qualified would state his or her opposition to this outright violation of the Fourth Amendment. Where is the ACLU? If the Indiana ruling against the Fourth Amendment is adopted by other states it would prove to be a national disaster. This is especially true if you consider the search and seizure rulings of recent times. If the Indiana ruling is combined with the current search and seizure rules it would mean the loss of one of our most important Constitutional protections. The question in my mind is whether or not I would be obligated to surrender my Constitutional rights in order to be in compliance? 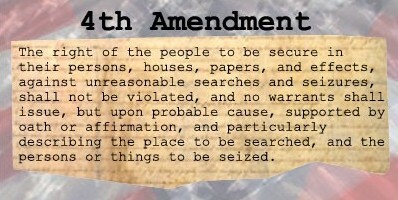 The right of the people to be secure in their persons, houses, papers, and effects, against unreasonable search or seizure, shall not be violated; and no warrant shall issue, but upon probable cause, supported by oath or affirmation, and particularly describing the place to be searched, and the person or thing to be seized. Notice that the state has no authority for arrest or search without probable cause. Therefore, without probable cause, agents of the state are acting outside their lawful authority if they arrest or search without probable cause. IOW, they are civilians guilty of trespass, acting under the color of law, which thing is deplorable.